Covertex Crank Up Wire Guide Blinds are a stylish solution for weather protecting your outdoor entertaining area with stainless componentry and a heavy-duty crank gear box. Stainless Steel Bottom Restraining Hardware. Alfresco Wire Guide Outdoor Cafe Blinds can generally be retrofitted to most pergolas without the requirement to modify the existing timber / steel structure. Blinds can be quickly cranked up or down in a matter of seconds with a few turns of the separable gear box crank handle supplied. Securing the bottom of blinds is easily achieved with captive pin shackles or carabina style fittings determined by the site requirements. 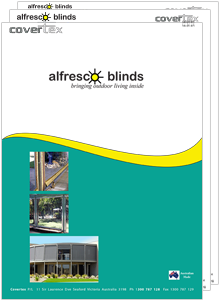 Blinds are manufactured from either 1mm PVC or high tenacity PVC coated polyester mesh for maximum service life. Spindle hardware is zinc plated and side wires, terminations & bottom restraining assemblies supplied in a stainless steel finish.